When the universe was young, a supermassive black hole — bloated to the bursting point with stupendous power — heaved out a jet of particle-infused energy that raced through the vastness of space at nearly the speed of light. Billions of years later, a trio of Clemson University scientists, led by College of Science astrophysicist Marco Ajello, has identified this black hole and four others similar to it that range in age from 1.4 billion to 1.9 billion years old. These objects emit copious gamma rays, light of the highest energy, that are billions of times more energetic than light that is visible to the human eye. The previously known earliest gamma-ray blazars — a type of galaxy whose intense emission is powered by extremely powerful relativistic jets launched by monstrous black holes — were more than 2 billion years old. Currently, the universe is estimated to be approximately 14 billion years old. Using Fermi data, Ajello and Paliya began with a catalog of 1.4 million quasars, which are galaxies that harbor at their centers active supermassive black holes. Over the course of a year, they narrowed their search to 1,100 objects. 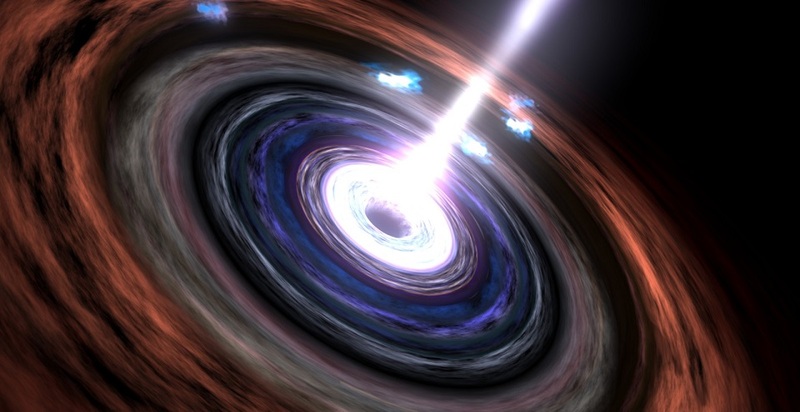 Of these, five were finally determined to be newly discovered gamma-ray blazars that were the farthest away – and youngest – ever identified. Marcotulli, who joined Ajello’s group as a Ph.D student in 2016, has been studying the blazars’ mechanisms by using images and data delivered from another orbiting NASA telescope, the Nuclear Spectroscopic Telescope Array (NuSTAR). At first, Marcotulli’s role was to understand the emission mechanism of gamma-ray blazars closer to us. Now she is turning her attention toward the most distant objects in a quest to understand what makes them so powerful. All galaxies have black holes at their centers – some actively feeding on the matter surrounding them, others lying relatively dormant. Our own galaxy has at its center a super-sized black hole that is currently dormant. Ajello said that only one of every 10 black holes in today’s universe are active. But when the universe was much younger, it was closer to a 50-50 ratio. The supermassive black holes at the center of the five newly discovered blazar galaxies are among the largest types of black holes ever observed, on the order of hundreds of thousands to billions of times the mass of our own sun. And their accompanying accretion disks – rotating swirls of matter that orbit the black holes – emit more than two trillion times the energy output of our sun. One of the most surprising elements of Ajello’s research is how quickly – by cosmic measures – these supersized black holes must have grown in only 1.4 billion years. In terms of our current knowledge of how black holes grow, 1.4 billion years is barely enough time for a black hole to reach the mass of the ones discovered by Ajello’s team.